Limited Time FREE Download Now! Tracking your spending and sticking to a budget is the easiest way to keep your money under control. Over 7000 5-star ratings from around the world are perfect proof that MoneyControl is the perfect choice to control your budget! Unlike similar apps, MoneyControl does not bother you with unimportant information on cluttered screens. The interface is kept simple while providing you with all the features you need to plan and manage your personal budget. ► The simple user interface makes it easy to track your spending. 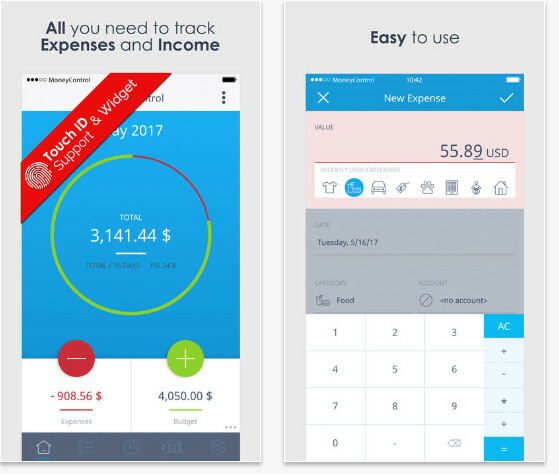 ► Enter new income and expense entries with just a few taps. ► Overview of the current budget and spending on the main screen. See at a glance how much money is left for the current month. ► See a list of all your spending on the entries page. Switch between a different month to compare how the budget developed in different periods. See where your money goes. ► Savings goal feature lets you plan and save for bigger spendings. Keep an eye on your savings progress and save more money when needed. ► Too much money spend? Create PDF Reports and interactive charts to visualize your spendings and budget. ► Sync data using Dropbox or the MoneyControl WebApp (https://primoco.me) to sync your spending across different devices.